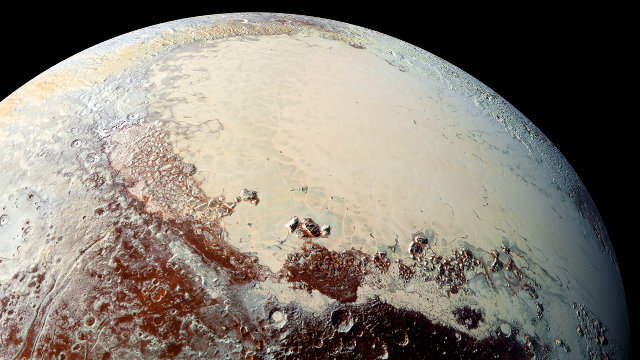 An article published in the journal “Nature” offers an explanation for the existence of Sputnik Planum, the heart-shaped basin on Pluto. Tanguy Bertrand and François Forget, two researchers at the Laboratoire de dynamique météorologie (CNRS/Ecole Polytechnique/ UPMC/ENS Paris) used computer simulations to show that the peculiar Pluto’s atmosphere and insolation favors condensation near the equator in the lower altitude areas. The result is nitrogen ice accumulation in that basin. Among the many extraordinary geological features of the dwarf planet Pluto discovered by the New Horizons space probe during its flyby on July 14, 2015 the heart-shaped basin is particularly recognizable. For scientists, it’s a very interesting formation with its layer of nitrogen ice that has an estimated thickness in 4 kilometers (2.5 miles) and above all for the fact that its age was estimated at about 100 million years, young in geological terms. Sputnik Planum has already been the subject of a lot of research and the ones published in the journal “Nature” in June 2016 offered an explanation for the renewal of its surface with a nitrogen cycle. Now the two French researchers conducted a study supported by the French space agency CNRS to explain the origin of that glacier and according to them it formed together with the basin. Computer simulations showed that the frozen nitrogen accumulates in the deepest part of the basin forming a permanent reserve. The heat from the Sun is limited and the consequence is that the ice is trapped but also the balance between the solid and gaseous nitrogen states contributes to the phenomenon. In the bottom of the basin the atmospheric pressure and therefore of nitrogen gas increases and the corresponding temperature of the frost is greater than that outside of the basin, with the result that nitrogen tends to freeze. The simulations covered about 50,000 Earth years of history of the dwarf planet Pluto to study the chemical evolution of the ice deposits. Besides nitrogen, there are methane and carbon monoxide cycles. The formation of these deposits was influenced by the shape of the surface with deep cavities that facilitate the cooling of nitrogen and the other chemical compounds. The simulations results were compared with data collected by the New Horizons spacecraft and are consistent with them. According to the researchers, the atmospheric pressure is at its seasonal peak and will decline over the coming decades while the seasonal frost will tend to disappear. Those are very slow processes so the next time a spacecraft, maybe in a few decades, will approach Pluto they’ll still be underway.